Would you like to move your fine art to Australia from the UK? We will pack it and transport in special containers. There is nothing more precious and delicate than fine art. 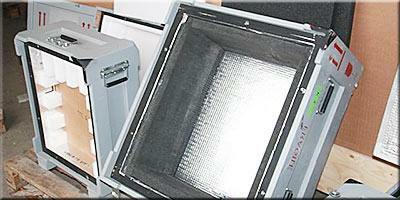 To move it you will need an art mover with a great experience in packing, shipping and delivery. Luckily we have all you need to get you art from the UK to Australia without any problem. Are you looking for a save option to ship your art? Give us a quick call or use our online form. Transporting work of arts is what we do best! Do you want to ship your art to Australia from the UK and you have no idea how to go about it? We are the market leader in the transport of work of arts. From the beginning of our activity, the company specializes in the transportation and storage of the fine art, personal goods and domestic furniture shipping. How to ship framed, canvas and fine art overseas? Our fine and canvas art international movers have a fleet of specialized vehicles fully adapted to the transport of works of art. Most our lorries and our art shipping container are equipped with: security systems, air conditioning, hydraulic lift, cargo securing systems. The entire fleet has air suspension as an additional protection against vibration during the transport. For the safety reasons, the vehicles are always served by two drivers. The company also offers transport trolleys, lifts and mobile cranes with a lifting capacity from 600 to 3500 kg. Our art moving firms offer a dedicated road transport as well as combined sea shipping and air freight of canvas, framed and fine art to Australia from the UK. By using worldwide air and ocean freight network of international artwork shippers and their agents we are in position to provide art delivery services to almost all Australian towns and cities like Sydney, Adelaide, Perth, Melbourne, Canberra, the Victoria, Queensland, New South Wales and more. Belonging to a global network allow us to deliver comprehensive services using the knowledge of the local area. The art transporting network allows us to offer a complete control over the art delivery and shipping time. 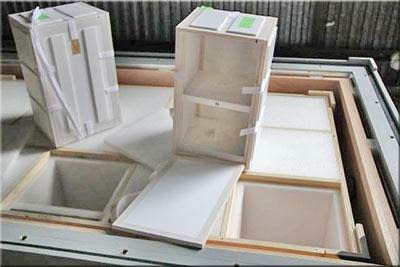 Do you wonder how to prepare and pack the fine art? How to prevent your fragile and precious possessions from damaging during the long shipping process? 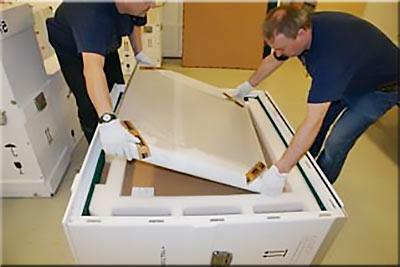 We have the knowledge and fully professional and technical equipment supporting and facilitating all activities connected with the preparation of works of art for shipping to Australia, USA, Canada, New Zealand, South Africa, etc..
Our modern and antique art shippers have a wide range of boxes, air conditioning crates and boxes with additional protection and with the ability to monitor the art. Each box can be tailored to an individual work of art. The highest quality of materials used and special packaging solutions guarantee the professional transport conditions even for the most sensitive objects. More than 90% of the materials used are biodegradable. Each art shipping container, wooden crate or cardboard box is equipped with straps, cushioning materials and other equipment for save and accurate packing in accordance with the standards required in the transport of work of arts to Australia.